Bit more progress. I decided to stick some of the life raft canisters to the hangar wall mounts. This is where a slight difference between Newcastle and Glasgow comes in. When built as Glasgow, this was done with the starboard side having 5 cannisters and another oblong mount. Im not sure if this was a build error or according to plan. All the pictures I have of Newcastle only show 4 canisters plus, an oblong container that presumably contains a number of separate inflatable life rafts. This meant I had to carefully cut away one of the life raft canister mounts. This can be seen in the first phot after removal. I then had to make the oblong container from the pictures I have. It is still not finished but can be seen in the 2nd picture. It still needs a little work before painting an gluing in place and sit on the remaining supports. A bit of a problem presents itself for the port side. The canisters line up from the stern going forward. Where the 4th canister mount is in the picture, both Newcastle and Glasgow appear to have a larger, squarer life raft(?) box then finally, another canister. This last canister sits a lot further forward, effectively at the beginning of the hangar wall walkway. If I want to replicate this, the currently empty canister supports are in the wrong place as can be seen in the next picture. Im not too confident of doing the necessary surgery here and will need careful cutting. A few more pictures to review. First one is of the port hangar side walkway and, position of life raft canisters etc. 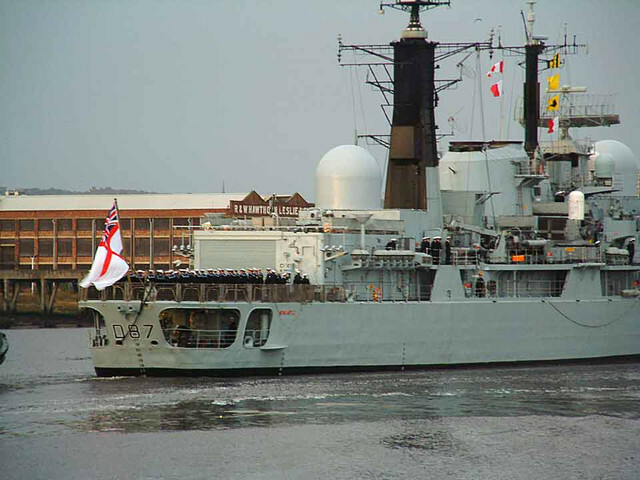 As mentioned before, these ships all had minor differences during their service. Newcastle port side hangar is one example of this. Life raft canisters sit on their normal racks stern going forwards. However, after the third and last canister in the picture, Newcastle had a box like structure presumably filled with individual life rafts? There was then a final life raft canister at the far end of the walkway. Anyway, this is different to Glasgow so needed to change. 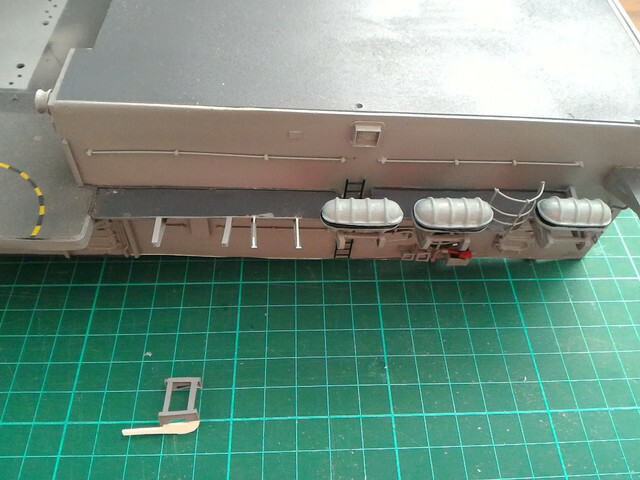 In the picture, Ive had to do a bit of surgery to remove the rack supports and manufacture a new one from the left overs. This can be seen separately on the mat. When painted, this, and the new support leg, will be glued at the far left of the walkway and the rack will then sit the in the right position on two supports. 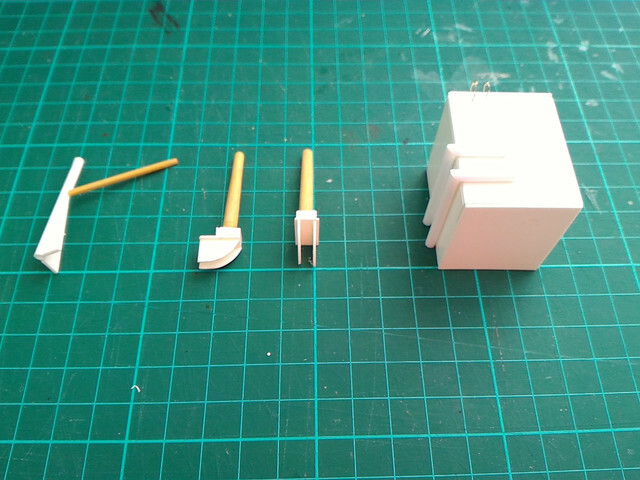 I then have to manufacture the box like structure which will, in effect, sit on the 3 supports. These may have to be trimmed back a little though. 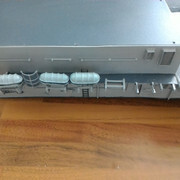 Next picture shows some minor detailing work to complement the hangar. From left to right, these are the roof derrick for deployment of the small rib or other items, two satellite dish supports and Scott Cabin pipe work. The satellite dish supports were particularly troublesome to make. Unfortunately, hand rails have been added to the hangar walls where each of these will be fitted. Not much I can do about this except cut a relief into the mounts so they fit snugly against the wall. 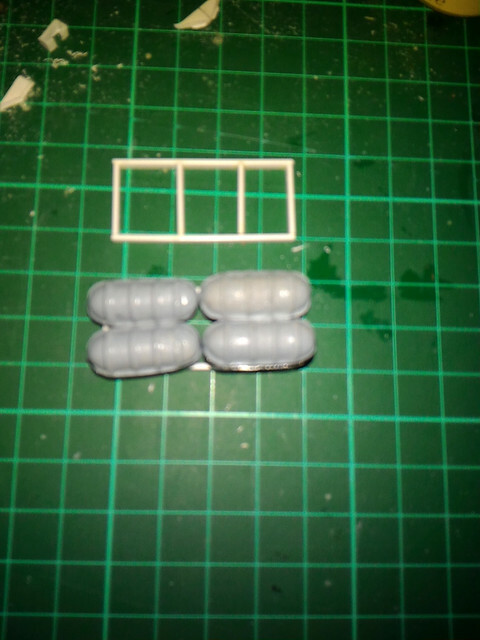 Also, I had numerous attempts at getting the small plasticard parts to look reasonable. Im still not 100% happy with them but, it is the best I can do. 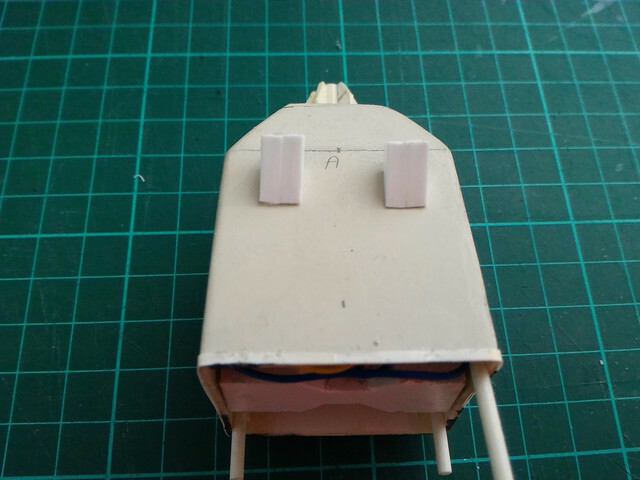 Despite trying, I couldnt find anything with a taper on it to represent the actual poles so had to resort to filing and sanding down some 5mm dowel. The next task will be to make the upturned mesh dishes! As far as the Scott Domes cabin pipes go, this again is where some ships differ. Some ships have very narrow gauge pipe work, some use broader gaugue and some even seem to use a retangular profile 'pipe'! Newcastle had a broad gauge pipe up the side and onto the roof which then transitioned to the narrow profile pipe. Unfortunately, the white balance in the picture has washed out the very small pipe work but it is there. Final picture for today is the main radar stubby generator tower. I still think this tower is 5 to 7mm too narrow (across the upper deck) but again, not much I can do now. These are a couple of exhaust outlets that sit just under the walkway. These will need a little trimming before painting black. They will be glued in place after the walkway is added and the tower is itself painted. Build wise, there are still numerous tasks such as build a small crane that sits on the starboard side superstructure in front of the hangar structure and, some life raft canisters racks that sit near midships. There are a few lockers scattered about the decks which I havent decided whether to build or just buy from Fleetscale, a port side davit, overhead heli hangar lights (Id like to have these working but am struggling to think of ways to hide the wire) and move the two aft GAMBO guns to the main superstructure. I have two ribs but these look like Atlantic sea boats and not only look too big but according to research, were not fitted during the era Im representing when Newcastle carried two small ribs (roughly 2003 just before decommissioning). The two biggest tasks are to finish off the required railings and re paint the hull with boot topping. So still plenty to do! Last edited by D92_Liverpool on Tue Nov 20, 2018 2:19 pm, edited 1 time in total. 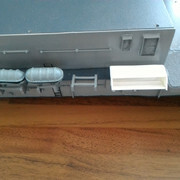 Been working on the life raft 'box' for the port side hangar wall but havent got the pictures together yet. I'll try and post some pictures later this week. Also been working on the starboard side deck crane that sits on the main superstructure in front of the hangar. Since I have no plans to work from, it is pretty much a case of eyeballing from pictures and estimating size. I dont have any close up or full side on views of the deck crane and the ones I have are from an angle to a greater or lesser degree. Fortunately, in a couple I have of Newcastle, there are some officers stood next to the crane as can be seen in the picture below so, I can get a rough estimate of things. In some pictures I have, the crane appears to sit on a round base but the picture shown, it looks just straight sided. Im going with a round base unless someone knows different! Eventually, I came up with this. The boom is rectangular stock. 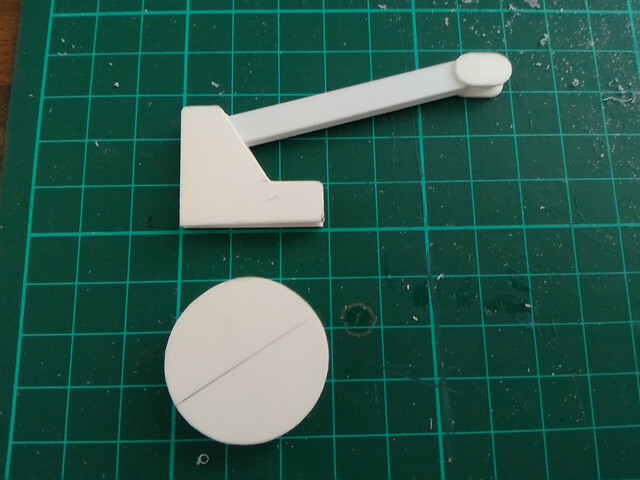 Side plates and jib end are made from plasticard as is the round base. Ive put some small pieces of rectangular stock between the side plates to act as spacers and keep things a little more square. The base is made of two discs again with some rectangular stock between the discs to give a bit of height as per on the ship. When ready, the body will be stuck to the base. There's still a bit of work to do such as facing work to the base, hydraulic rams and a little additional surface detail. I see the number of views is increasing on this thread but dont know if that is due to internet 'bots' or actual people viewing the thread, LOL. Be a bit disappointing if Im just getting bot page views and not real people. Not much I can do about it and there appears to be very little activity on this forum now which is a shame. I dont know if I will be able to make any more posts after this one this year what with the rush to Christmas now on. If I can, I will but if not, I'll pick up the thread in the New Year (2019!) and there wont be a 6 year break. Im determined to get Newcastle into a position where I can decide to either sell her as an RC model or just static display. There's loads left to do to represent Newcastle as she was circa 2003 before she decomissioned in 2005 but most of the major superstructure changes and additions I wanted to do have either been bought from Fleetscale or scratch built and, await painting. Ive still to build the funnel 'wings' that hold the ship's badge. As I see it, the major things to do are the remaining deck railings and re spraying the whole hull but, the smaller jobs like finishing off the 4.5" gun, moving the 2 GAMBOs to midships (this requires a small modification to the upper deck bulwark) is going to take just as long etc. Id like to make the over hangar lights, hangar wings floodlights and a hangar interior light to be working but I might be over stretching myself so we'll see how we go. Just in case anyone was wondering, I intend painting all the additional parts Ive made or changed at more or less the same time. This is because I dont want to crack open the (expensive) bottles of Tamiya paints and have them start evaporating as they invariably do when you open a new bottle. OK so what have I done? 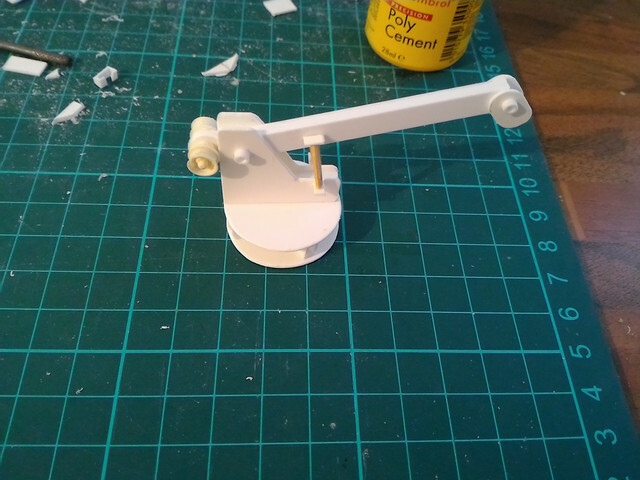 Well, Ive done a little more detailing work on the deck crane and added hydraulic rams and end of jib pulleys. Still need to infill the base though. With hindsight, I should have had the jib sit at a little higher angle as the stand the RIB sits on is also quite high as can be seen in this picture of Newcastle. 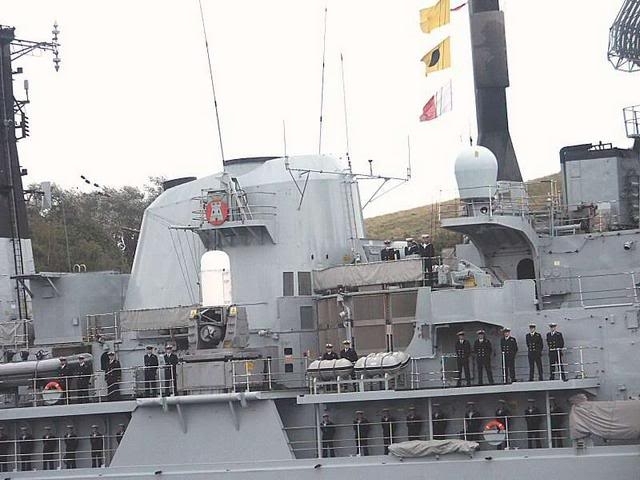 Notice the bow of the RIB is actually higher than the deck officer's head! Im not sure if this size of RIB is referred to as an Atlantic or Pacific. Fleetscale calls them Pacifics though. And here is the start of my RIB build. Lots of work to do here especially on the boat deck stands! 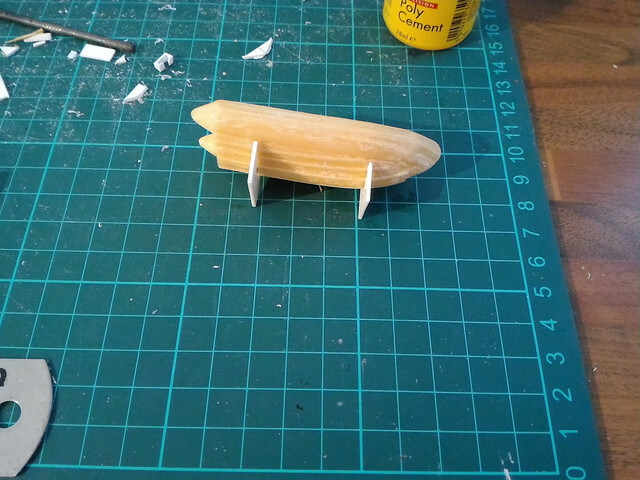 I originally thought the two moulded RIBs I had were too big but after studying various pictures and sighting against the model I think they are just OK. Fleetscale do a smaller RIB and I think it is this sized version that sits on the hangar roof in ship's later life. Well this is deffo the last update on the build until the New Year! Regarding the ship's boats being Atlantics or Pacifics, I did a little research. The easiest way to tell them apart is, Atlantics are orange while Pacifics are grey. The Pacifics are also supposed to be exclusively powered by a diesel engine while Atlantics use petrol. There are other difference but according to the RIB forum experts i found, that how you tell them apart. So, the ship's boats are Pacifics! Ive done a little bit more work since the last post including using a profile gauage to get the funnel curve for the funnel badge wings. Couple of photos, the port hangar side life rack 'box' is still a work in progress. It looks a little wonky in the picture but it's just the angle I took it at. I have to manufacture life raft 'blocks' to go inside. Not looking forward to that! Apologies for the next picture, it is a little out of focus. This is the start of the midships life rack stand seen in the previous post's picture. The alert ones will notice what I made carries 4 canisters while the midships picture shows 3. 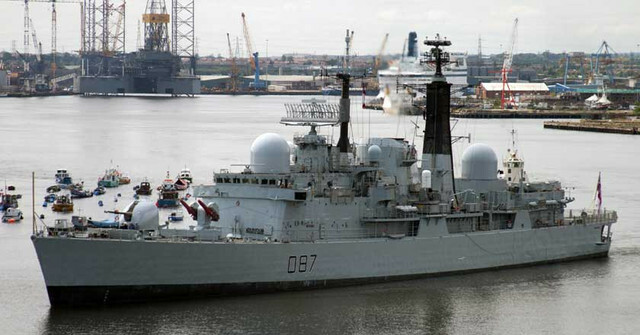 However, a picture of Newcastle in 2003 I have shows this was updated to hold 4 canisters. As this is the era Im building Newcastle to represent, Im going with the 4! So, that's about it for this year, I'll pick up the build in the New Year (that's 2019 not 2024 after the last 'break'!). Until then, Merry Christmas and Happy New Year to anyone following this thread! Last edited by D92_Liverpool on Thu Dec 13, 2018 2:42 pm, edited 1 time in total. Apologies to anyone following this thread! Time passes quickly and Ive been roped in with some odd jobs and decorating around the house. This has impacted my ability to pick up the build after Christmas. Im hoping to get back into the build in a few weeks but Ive number 1 son's wedding coming up in a couple of months and that may become the new priority. Besides which, there's not much in the scheme of things to build regarding superstructure. They are small individual jobs, the big task will be painting and that needs warmer conditions in the garage before I attempt that. That said, Im having problems with the midships life canister rack shown in one of the pictures in the post immediately above. This is a ladder like affair that holds the canisters at a jaunty angle for going over the ship's side. Problem Im having is getting the angles and size right for the individual pieces. 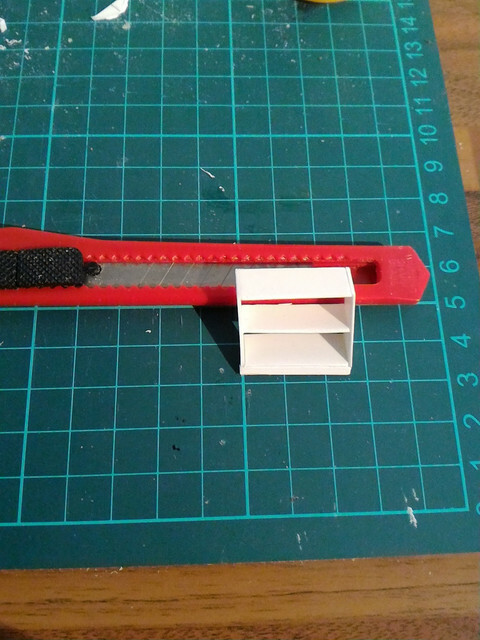 The plastic strip I have is not Evergreen and is quite hard to cut. I dont fancy a near 40 mile round trip to the nearest stockist to get some Evergreen strip, postage costs more than the strip itself so, tough decision! That's all for now, stay tuned and I'll provide an update soon as I can.